Isaac Newton's Cannonball. 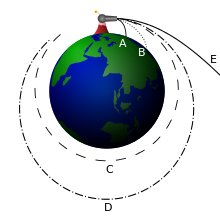 Paths A and B depict a sub-orbital trajectory. By one definition a sub-orbital spaceflight reaches an altitude higher than 100 km (62 mi) above sea level. This altitude, known as the Kármán line, was chosen by the Fédération Aéronautique Internationale because it is roughly the point where a vehicle flying fast enough to support itself with aerodynamic lift from the Earth's atmosphere would be flying faster than orbital speed. The US military and NASA award astronaut wings to those flying above 50 mi (80 km), although the U.S. State Department appears to not support a distinct boundary between atmospheric flight and spaceflight. To minimize the required delta-v (an astrodynamical measure which strongly determines the required fuel), the high-altitude part of the flight is made with the rockets off (this is technically called free-fall even for the upward part of the trajectory). (Compare with Oberth effect.) The maximum speed in a flight is attained at the lowest altitude of this free-fall trajectory, both at the start and at the end of it. If one's goal is simply to "reach space", for example in competing for the Ansari X Prize, horizontal motion is not needed. In this case the lowest required delta-v, to reach 100 km altitude, is about 1.4 km/s. Moving slower, with less free-fall, would require more delta-v.
For sub-orbital spaceflights covering a horizontal distance the maximum speed and required delta-v are in between those of a vertical flight and a LEO. The maximum speed at the lower ends of the trajectory are now composed of a horizontal and a vertical component. The higher the horizontal distance covered, the greater the horizontal speed will be. (The vertical velocity will increase with distance for short distances but will decrease with distance at longer distances.) For the V-2 rocket, just reaching space but with a range of about 330 km, the maximum speed was 1.6 km/s. Scaled Composites SpaceShipTwo which is under development will have a similar free-fall orbit but the announced maximum speed is 1.1 km/s (perhaps because of engine shut-off at a higher altitude). For larger ranges, due to the elliptic orbit the maximum altitude can be much more than for a LEO. On a 10,000-km intercontinental flight, such as that of an intercontinental ballistic missile or possible future commercial spaceflight, the maximum speed is about 7 km/s, and the maximum altitude may be more than 1300 km. Any spaceflight that returns to the surface, including sub-orbital ones, will undergo atmospheric reentry. The speed at the start of the reentry is basically the maximum speed of the flight. The aerodynamic heating caused will vary accordingly: it is much less for a flight with a maximum speed of only 1 km/s than for one with a maximum speed of 7 or 8 km/s. Note that the altitude of apogee is maximized (at about 1320 km) for a trajectory going one quarter of the way around the earth (10 000 km). Longer ranges will have lower apogees in the minimal-delta-v solution. (where g is the acceleration of gravity at the earth's surface). We see that the Δv increases with range, leveling off at 7.9 km/s as the range approaches 20 000 km (halfway around the world). The minimum-delta-v trajectory for going halfway around the world corresponds to a circular orbit just above the surface (of course in reality it would have to be above the atmosphere). See lower for the time of flight. An intercontinental ballistic missile is defined as a missile that can hit a target at least 5500 km away, and according to the above formula this requires an initial speed of 6.1 km/s. Increasing the speed to 7.9 km/s to attain any point on Earth requires a considerably larger missile because the amount of fuel needed goes up exponentially with delta-v (see Rocket equation). The initial direction of a minimum-delta-v trajectory points halfway between straight up and straight toward the destination point (which is below the horizon). Again, this is the case if we ignore the earth's rotation. It is not exactly true for a rotating planet unless the launch takes place at a pole. In a vertical flight of not too high altitudes, the time of the free-fall is both for the upward and for the downward part the maximum speed divided by the acceleration of gravity, so with a maximum speed of 1 km/s together 3 minutes and 20 seconds. The duration of the flight phases before and after the free-fall can vary. For an intercontinental flight the boost phase takes 3 to 5 minutes, the free-fall (midcourse phase) about 25 minutes. For an ICBM the atmospheric reentry phase takes about 2 minutes; this will be longer for any soft landing, such as for a possible future commercial flight. Sub-orbital flights can last many hours. Pioneer 1 was NASA's first space probe, intended to reach the Moon. A partial failure caused it to instead follow a sub-orbital trajectory, reentering the Earth's atmosphere 43 hours after launch. As one can see from the form involving arccosine, the derivative of the time of flight with respect to d (or θ) goes to zero as d approaches 20 000 km (halfway around the world). The derivative of Δv also goes to zero here. So if d = 19 000 km, the length of the minimum-delta-v trajectory will be about 19 500 km, but it will take only a few seconds less time than the trajectory for d = 20 000 km (for which the trajectory is 20 000 km long). Profile for the first manned American sub-orbital flight, 1961. Launch rocket lifts the spacecraft for the first 2:22 minutes. Dashed line: zero gravity. While there are a great many possible sub-orbital flight profiles, it is expected that some will be more common than others. 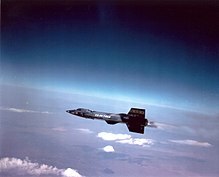 The X-15 (1958–68) would lift itself to an altitude of approximately 100 km and then glide down. The first sub-orbital vehicles which reached space were ballistic missiles. The very first ballistic missile to reach space was the German V-2, the work of the scientists at Peenemünde, on October 3, 1942 which reached an altitude of 60 miles (97 km). Then in the late 1940s the USA and USSR concurrently developed missiles all of which were based on the V-2 Rocket, and then much longer range Intercontinental Ballistic Missiles (ICBMs). There are now many countries who possess ICBMs and even more with shorter range IRBMs (Intermediate Range Ballistic Missiles). Sub-orbital tourist flights will initially focus on attaining the altitude required to qualify as reaching space. The flight path will probably be either vertical or very steep, with the spacecraft landing back at its take-off site. The spacecraft will probably shut off its engines well before reaching maximum altitude, and then coast up to its highest point. During a few minutes, from the point when the engines are shut off to the point where the atmosphere begins to slow down the downward acceleration, the passengers will experience weightlessness. Megaroc had been planned for sub-orbital spaceflight by the British Interplanetary Society in the 1940s. In the autumn of 1945, the group M. Tikhonravov K. and N. G. Chernysheva at NII-4 rocket artillery Academy of Sciences technology on its own initiative the first stratospheric rocket project was developed by BP-190 for vertical flight two pilots to an altitude of 200 km based on captured German ballistic rocket V-2. In 2004, a number of companies worked on vehicles in this class as entrants to the Ansari X Prize competition. The Scaled Composites SpaceShipOne was officially declared by Rick Searfoss to have won the competition on October 4, 2004 after completing two flights within a two-week period. In 2005, Sir Richard Branson of the Virgin Group announced the creation of Virgin Galactic and his plans for a 9-seat capacity SpaceShipTwo named VSS Enterprise. It has since been completed with eight seats (one pilot, one co-pilot and six passengers) and has taken part in captive-carry tests and with the first mother-ship WhiteKnightTwo, or VMS Eve. It has also completed solitary glides, with the movable tail sections in both fixed and "feathered" configurations. The hybrid rocket motor has been fired multiple times in ground-based test stands, and was fired in a powered flight for the second time on 5 September 2013. Four additional SpaceShipTwos have been ordered and will operate from the new Spaceport America. Commercial flights carrying passengers were expected in 2014, but became cancelled due to the disaster during SS2 PF04 flight. Branson stated, "[w]e are going to learn from what went wrong, discover how we can improve safety and performance and then move forwards together." A major use of sub-orbital vehicles today are as scientific sounding rockets. Scientific sub-orbital flights began in the 1920s when Robert H. Goddard launched the first liquid fueled rockets, however they did not reach space altitude. In the late 1940s, captured German V-2 ballistic missiles were converted into V-2 sounding rockets which helped lay the foundation for modern sounding rockets. Today there are dozens of different sounding rockets on the market, from a variety of suppliers in various countries. Typically, researchers wish to conduct experiments in microgravity or above the atmosphere. Research, such as that done for the X-20 Dyna-Soar project suggests that a semi-ballistic sub-orbital flight could travel from Europe to North America in less than an hour. However, the size of rocket, relative to the payload, necessary to achieve this, is similar to an ICBM. ICBMs have delta-v's somewhat less than orbital; and therefore would be somewhat cheaper than the costs for reaching orbit, but the difference is not large. The SpaceLiner is a hypersonic suborbital spaceplane concept that could transport 50 passengers from Australia to Europe in 90 minutes or 100 passengers from Europe to California in 60 minutes. The main challenge lies in increasing the reliability of the different components, particularly the engines, in order to make their use for passenger transportation on a daily basis possible. SpaceX is planning to use its BFR launch vehicle as a sub-orbital point-to-point transport. The first sub-orbital space flight was in June 1944, when a V-2 test rocket launched from Peenemünde in Germany reached 189 kilometres altitude. Bumper 5, a two-stage rocket launched from the White Sands Proving Grounds. On 24 February 1949 the upper stage reached an altitude of 248 miles (399 km) and a speed of 7,553 feet per second (2300 meters per second approx.) which is nearly Mach-7. Above at least 100 km in altitude. Private companies such as Virgin Galactic, XCOR, Armadillo Aerospace (reinvented as Exos Aerospace), Airbus, Blue Origin and Masten Space Systems are taking an interest in sub-orbital spaceflight, due in part to ventures like the Ansari X Prize. NASA and others are experimenting with scramjet based hypersonic aircraft which may well be used with flight profiles that qualify as sub-orbital spaceflight. Non-profit entities like ARCASPACE and Copenhagen Suborbitals also attempt rocket-based launches. ^ "Martlet". Archived from the original on 2010-09-26. ^ "100 km Altitude Boundary for Astronautics". Fédération Aéronautique Internationale. Archived from the original on 2011-08-22. Retrieved 2017-09-14. ^ Whelan, Mary (5 June 2013). "X-15 Space Pioneers Now Honored as Astronauts". nasa.gov. Archived from the original on 11 June 2017. Retrieved 4 May 2018. ^ "85. U.S. Statement, Definition and Delimitation of Outer Space And The Character And Utilization Of The Geostationary Orbit, Legal Subcommittee of the United Nations Committee on the Peaceful Uses of Outer Space at its 40th Session in Vienna from April". state.gov. Archived from the original on 4 May 2018. Retrieved 4 May 2018. ^ Germany's V-2 Rocket, Kennedy, Gregory P.
^ Hollingham, Richard. "How a Nazi rocket could have put a Briton in space". bbc.com. Archived from the original on 14 November 2016. Retrieved 4 May 2018. ^ "Megaroc". www.bis-space.com. Archived from the original on 30 October 2016. Retrieved 4 May 2018. ^ "Branson on Virgin Galactic crash: 'Space is hard – but worth it'". CNET. Retrieved August 1, 2015. ^ "ch2". history.nasa.gov. Archived from the original on 2015-11-29. Retrieved 2015-11-28. ^ "The Space Review: Point-to-point suborbital transportation: sounds good on paper, but…". www.thespacereview.com. Archived from the original on 1 August 2017. Retrieved 4 May 2018. ^ Sippel, M. (2010). "Promising roadmap alternatives for the SpaceLiner". Acta Astronautica. ^ "Bumper Project". White Sands Missile Range. Archived from the original on 2008-01-10. ^ Amos, Jonathan (3 June 2014). "Airbus drops model 'space jet'". Archived from the original on 4 May 2018. Retrieved 4 May 2018 – via www.bbc.co.uk.